These white aluminum trim moldings are made from the same .040" 3105-H14 aluminum that we sell in sheet form. They are used to attach sheets as wall coverings and backsplashes, along with providing aesthetic covering for seams between sheets and around corners. Our trim moldings have deep pockets to allow for variance in the existing wall and also have extra wide nailing strips to make installation more convenient. Note: -When ordering material, you will need to subtract from the sheet size to account for the trim (see drawings). The edge trim molding is made from our .040” 3105-H14 white aluminum sheet stock. Edge trim molding is used to make a finished edge. The pocket is 1”, and you do not need to subtract any for this specific trim molding. 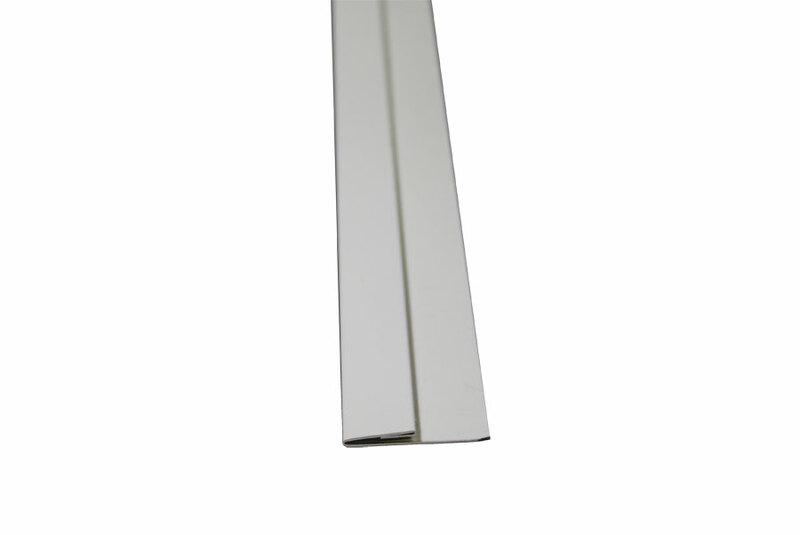 The divide trim molding is made from our .040” 3105-H14 white aluminum sheet stock. Divide trim molding is used to join two adjacent sheets on the same wall. The pocket for each side is 7/16”, and subtracting 1/8” from each sheet will accommodate for this trim. The inside corner trim molding is made from our .040” 3105-H14 white aluminum sheet stock. Inside corner trim molding is used to join two sheets at 90° on an inside corner. The pocket for each side is ¾”, and subtracting 7/8” from the sheet size will accommodate for this trim. The outside corner trim molding is made from our .040” 3105-H14 white aluminum sheet stock. Outside corner trim molding is used to join two sheets at 90° on an outside corner. The pocket for each side is ¾”, and subtracting 3/16” from the sheet size will accommodate for this trim.